For agriculture spraying it’s the new drone on the block vs the tried and true. Yamaha’s RMAX has been in production since 1997 and treats 2.4 million acres of farmland in Japan each year (2014). The DJI Agras MG-1 on the other hand is a newly released model from the world leader in the consumer UAV mulicopter market and is looking to capture a portion of the agriculture commercial sector. 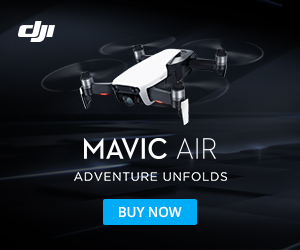 The above video is a good introduction from DJI of the Agras MG-1. Looking at the below features and specifications for both rigs you get a sense that the RMAX may be looking at some competition in the agriculture market from the Agras MG-1. Big differences include flight time with payloads where the RMAX has estimates of 1 hour on the gas engine while the MG-1 has 10 min on the batteries and the RMAX has a larger standard payload capacity … therefore it looks like you would be landing and changing out batteries and refilling payload more often with the MG-1, depending on the size of the spray operation. That said, the MG-1 is a smaller, lighter vehicle and comes with DJI’s Smart flight mode. Yamaha says the RMAX will be offered as a service and will require two individuals—one pilot‐in‐command (PIC) and one visual observer (VO)—who have both completed the Yamaha RMAX training and certification program. The Agras Mg-1 is an octocopter design UAV for precision variable rate application of liquid pesticides, fertilizers and herbicides, bringing new levels of efficiency and manageability to the agricultural sector with cost estimates of around $15,000. Under Smart mode, the flight can be easily planned with the press of a few buttons, without the need for mapping knowledge or other software, making the MG-1 not only the most efficient but also the most easy to use spraying solution. Motor arms fold inwards making the aircraft compact and easy to transport, for example in the trunk of a car. Made from high-strength carbon fiber materials, the body frame is light yet durable and able to withstand the harshest conditions. The RMAX is a helicopter design UAV for precision agriculture spraying with price estimates from $80-$120,000, however, according to the company website “Yamaha will offer a service to interested growers; however, in the future we also plan to offer a lease option to growers/businesses that have the proper licenses and qualifications. Yamaha does not intend to sell the aircraft now nor in the future.” As of 2014 there with over 2,600 vehicles operating worldwide. Each operation and flight of the RMAX will require two individuals—one pilot‐in‐command (PIC) and one visual observer (VO)—who have both completed the Yamaha RMAX training and certification program. In 2015 the Federal Aviation Administration (FAA) authorized Yamaha to operate the remotely piloted RMAX helicopter for agricultural‐related uses in the U.S. The Yamaha RMax tests in Napa Valley’s famed vineyard growing wine region of Northern California an experimental design deploying a fungicidal application that prevents mildew from growing on the grapes.